(Phys.org)—A pair of tiny silk and leather slippers have lain unnoticed in the vast collections of the University of Aberdeen for more than 140 years. But thanks to the detective work of a curatorial assistant it has been discovered that the embroidered shoes boast a royal connection and once belonged to Napoleon Bonaparte's sister, Princess Pauline Borghese. Their colourful history was unearthed by Louise Wilkie, who joined the museum team last June and was working on one of her first major assignments. She was tasked with cleaning and sorting through a collection belonging to the Banff-born medical graduate and extensive traveller Robert Wilson (1787 – 1871). The decorative shoes, which are equivalent to a UK children's size two and incredibly narrow, measuring just 40mm across the toes, took Louise's attention. They were contained within a chest of clothes and were simply marked on the sole 'Pauline Rome' so she decided to investigate further. Louise said: "Robert Wilson left his collection of objects from his extensive travels to the museum in his will in 1871. "In a list of the objects donated by Wilson is the description of 'A pair of slippers – Pauline, Rome Jan 20th 1824'. The same inscription is on the base of the slipper. "I began to look at other archival material held by the University and found that Wilson had a friendship with Princess Pauline Borghese, the sister of Napoleon Bonaparte. "Letters from him to Pauline show a close friendship and in his diary he describes how she spent a lot of time with him travelling in Italy and gave him many gifts, including a ring which is also held in the museum collections." The delicate dimensions of the slippers also fit with descriptions of Princess Pauline, who was said to have been an exquisitely beautiful but very petite woman, who was often carried from room to room. She was a colourful character - the youngest sister of Napoleon who became Princess Pauline when she married Prince Camillo Borghese in 1803. This marriage was not a happy one, due to Pauline's infidelity and much of her life was riddled with scandal. She met Wilson, who graduated in Medicine from Marischal College and served as a ship's surgeon with the East India Company, in the 1820s. With wealth secured through profitable trading while in the Company's service and a driving curiosity, Wilson had become a prolific traveller. Louise added: "The relationship between Wilson and Princess Pauline can only be speculated upon, however records do indicate some form of attraction and attachment. "It seems she spent a great deal of time with him in Italy and a close friendship developed. "He kept the gifts she had given him for life and then they passed to the University collections. "It is amazing to think the slippers have been here all this time but their significance was never fully realised. I was delighted to make a discovery of this kind, especially so early into my work in museums." 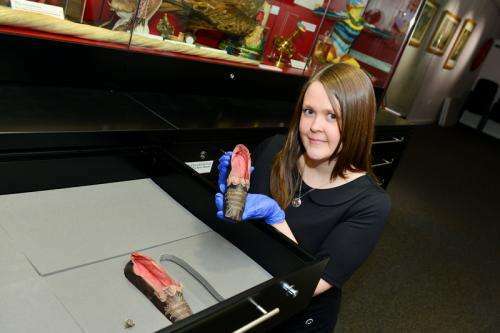 Princess Pauline's slippers and the ring she gifted to Wilson are now on display for the first time in the University of Aberdeen's King's Museum as part of a display of '100 Curiosities'. Neil Curtis, Head of Museums at the University of Aberdeen, said: "The University holds huge collections and many of the items given to us over the years do not have full descriptions. "It was a great piece of detective work from Louise to piece together the fascinating history behind the slippers. "We are delighted that these significant objects are now on display and can be enjoyed by the public for the first time."